With the temperature climbing, the snow gives way to rain and puddles, which can lead to muddy paws and matted coats for man’s best friend. Luckily, the folks at Bubbly Paws Dog Wash have it covered—and are happy to clean up the mess afterward. The self-serve and full-service doggy wash, which has been operating for eight years with four locations across the Twin Cities, is the perfect spot to bring Fido for a dip and get him prettied up for spring. 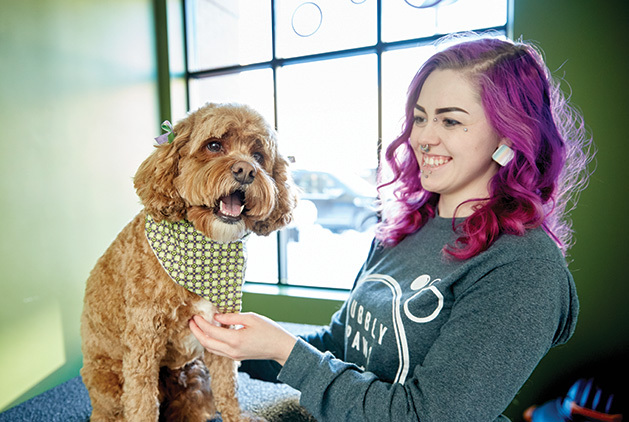 “Spring is one of our busiest times,” says Julie McMullen, the general manager of Bubbly Paws in Maple Grove. With the weather being unpredictable, Bubbly Paws is often frequented by muddy dogs coming straight from a dog park run or fresh off a long walk. “The self-service option is a great choice for spring, as sometimes dogs will find that mud puddle when you least expect it,” she says. If a dog has a coat that’s a bit too much for an owner to handle, the folks at Bubbly Paws offer full-service baths, as well. The complete spa treatment includes a bath, ear cleaning, nail trim and brush out, with plenty of extras like nail grinds and facial scrubs to keep any dog feeling like king or queen for a day. McMullen also warns against weekly bathing. She recommends dogs with normal skin be bathed once a month. If a dog has a coat that’s prone to getting tangled, taking them in for a groom is recommended every six to eight weeks. Once bath time is over, Bubbly Paws takes care of any dropped fur and leftover suds, giving pet owners time to admire their freshly-bathed dog and enjoy what should be a bonding session between owner and pet. Let’s face it; how long can a dog’s paws stay clean when tempting puddles and inviting off-the-beaten-path trails beckon even the most well-behaved pooch? Bubbly Paws has folks covered on that front, as well. Heard of Puss in Boots? How about pooch in boots? Yup, Bubbly Paws has a healthy stock of Pawz booties on hand for any practical and fashion-forward pet.